There’s only one person who can help: Private Investigator Madison Attallee, the first officer on the scene all those years ago. 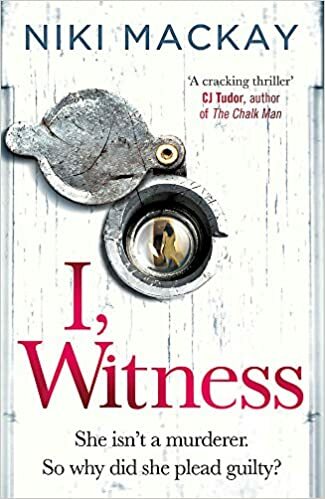 I, Witness is an intriguing start to a new series by Niki Mackay. It introduces former police detective, now turned private investigator, Madison Attallee. Niki’s writing certainly has that addictive quality to it; the plot, the characters and the mysteries in their lives will keep you turning the pages. Having recently set up her own private detective agency after leaving the metropolitan police, Madison is shocked when, Kate Reynolds, who has recently been released from prison, seeks her help to prove her innocence. Six years earlier, Kate was charged with manslaughter after killing her friend, however she doesn’t believe she was responsible for her friend’s death. Madison is sceptical about taking Kate on and of what she will be able to achieve for her but her interest is certainly piqued. As Madison begins to look again at the investigation, startling revelations begin to emerge which could shine a whole new light on the murder and which could prove Kate’s innocence. I haven’t read many books which feature private investigators, and for me, this is what made this book feel fresh. As well as hearing from Madison’s voice, we also hear from three other characters: Kate Reynolds, Claudia Reynolds who is Kate’s sister-in-law and Anthea Andrews, the mother of Kate’s friend who was killed. The idea that hooked me in this book was Kate’s insistence that she was innocent and I was interested to see how this would affect the other characters who’s voices we hear from. It was a question which pulled me into the mystery. Why would Kate suddenly think this, when six years ago she pleaded guilty? An interesting spin which Niki put on Madison’s character was that she had been involved in the original enquiry that lead to Kate’s arrest. Most private investigators don’t have a personal connection to the case and often they are employed to lend fresh eyes. This did make me wonder why Kate had chosen an investigator who she had previously had dealings with and who may not be very sympathetic towards her. This was an enjoyable read with some exciting twists and turns that take you into slippery and murky depths as family secrets are exposed. I am pleased to see that this is the start of a new series featuring Madison and I’m looking forward to seeing where Niki will take her next. Thank you to Tracy Fenton at The Book Club for inviting me to take part in the tour. Have you read the Cormoran Strike series? I only read the first book but i liked that a lot. Yes I have, I’ve really enjoyed the Strike novels. I hope you enjoy I, Witness when you read it. Really enjoyed your review Jacob, I’d love to share it but unfortunately am banged up in Twitter jail ATM. 🙄☹️ Just so you know I loved it! Thank you. And no worries at all, Twitter is a nightmare for sharing posts at the moment.